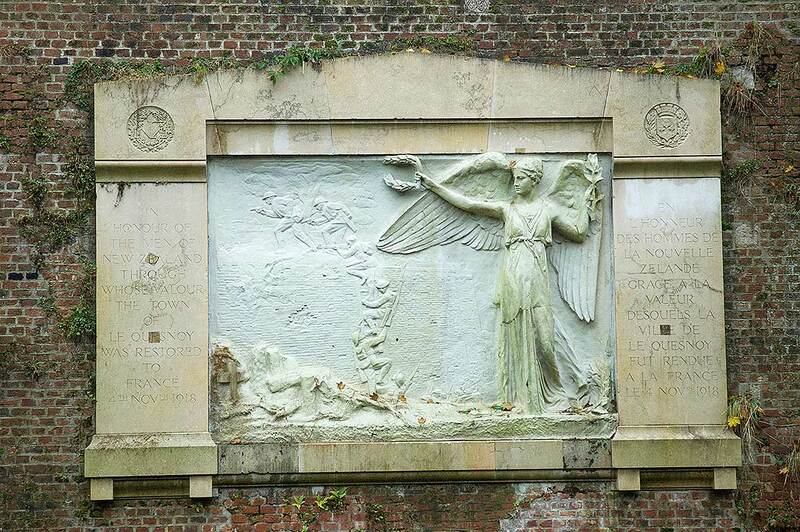 As the centenary of the First World War draws to an end it is appropriate to reflect on the legacy of the conflict, and the places that are key to the New Zealand experience of the war, such as Ypres and Le Quesnoy. While a few old myths that sustain simplistic notions of national identity persist, over the last four years our understanding of the 1914-18 conflict and the way it continues to have an impact on how we see ourselves, our forebears and place in the world has grown. Like many New Zealanders, senior lecturer Euan Robertson from Massey University’s College of Creative Arts has a family connection to the war. In November, he will travel to France and Belgium to participate in centenary events concerned with his relatives’ experience of the conflict. The commemoration of the signing of the armistice to end the First World War on November 11 will find Robertson in the Belgium town of Ieper (Ypres) at the centre of a region full of cemeteries, memorials, and museums dedicated to remembering those who fought and died over four bloody years. Many travellers in this part of Flanders will be there to visit the graves of family members or search for their relatives’ names on the various memorials to the missing, such as Menin Gate in Ieper. On this memorial, which lists 54,896 British and Commonwealth soldiers whose bodies were never recovered, is the name of one of Robertson’s great-uncles, Corporal James Robertson. On November 9 he will be playing three original bagpipe compositions, including a waiata at the gate in tribute to his relative and their comrades who have no known grave. A week before the armistice centenary, as part of a First World War commemoration in the northern French town of Le Quesnoy, Robertson will play two other original bagpipe tunes, The Liberation of Le Quesnoy and Marching up Rue Nouvelle Zélande. On November 4, 1918, soldiers of the New Zealand Rifle Brigade audaciously scaled the walls of the fortified town and liberated the inhabitants who had experienced four years of occupation by German troops. Robertson’s connection to the town is through another great uncle, Alexander Fraser, a designer of the New Zealand battlefield memorial sited in one of the brick walls encircling the town. Fraser’s design depicts the New Zealanders climbing a ladder to reach the top of the ramparts. Many other New Zealanders will be gathering in Le Quesnoy at this time to commemorate these actions. Also remembering in gratitude will be its townspeople who have maintained a strong bond with New Zealand and its people for much of the last century. In New Zealand during the four years of the First World War centenary there has been much commemorative activity. Manatū Taonga Ministry for Culture and Heritage’s WW100 website has catalogued an extraordinary array of events throughout the country ranging from large-scale projects sponsored by government to more modest ‘grassroots,’ community-based events and even anti-war actions. In the capital, a new memorial park has been built at the National War Memorial and occupied to date by memorial contributions from Australia, the UK, Belgium, France, and Turkey and shortly, the US. Substantial exhibitions such as the collaboration between Museum of New Zealand Te Papa Tongarewa and Weta Workshop, Gallipoli: The Scale of Our War, has drawn record numbers of visitors to the museum. In Sir Peter Jackson’s The Great War Exhibition, the colourisation of photographs of New Zealand soldiers of a century ago uncannily projects these subjects into the present. Many other cultural forms and resources related to World War I were developed over the centenary period including ballet, musical compositions, written histories, theatre, poetry, art exhibitions, as well as biographical databases and conferences. The Centenary History Programme, a partnership between Massey University, Ministry for Culture and Heritage, and the New Zealand Defence Force has made a unique contribution to our knowledge about the conflict by producing 14 volumes that form the first complete and detailed account of New Zealand’s World War I experience. So, what will be the legacy of this intensive four-year World War I commemoration period? With the centenary almost over, it is natural that this conflict will recede somewhat from our consciousness. For members of WHAM (war, history, heritage, art, and memory) Research Network such as Robertson and myself, the last four years have been focused on the First World War, including the organisation of an international, multi-disciplinary symposium, The Myriad Faces of War: 1917 and its Legacy and an ensuing book. Now the network’s attention will be directed towards new projects, some in collaboration with our national and international partners, that will advance a deeper public understanding of conflict, its causes, and its impact. In addition, the work of the network will be future-focused, aiming to contribute to the discourse of the ‘wicked problems’ faced by humankind—from nuclear proliferation to climate change—that could provide the spark for conflicts to come. Perhaps it is too optimistic to imagine that the world’s reflection on the 1914-18 war over this centenary period will deter humanity from embarking on another such cataclysm. Kingsley Baird is Professor of Fine Arts at Massey University’s College of Creative Arts. His longstanding art practice concerned with memory and remembrance includes designing the Tomb of the Unknown Warrior, the New Zealand Memorial in Canberra (with Studio of Pacific Architecture) and the Cloak of Peace in Japan.